No matter what part of the country you live in, the holidays bring thoughts of a table full of delicious comforting foods and the stars of these feasts on most tables are turkey, stuffing and gravy. These main elements of a holiday dinner are cooked rather differently depending on your region of the country. Although many still slow roast their turkey, more and more people are frying it, a tradition that most believe started in Louisiana sometime during the 1930’s. In 1996 in the November issue of Martha Stuart Living an article entitled “Southern Fried Turkey Dinner” brought light to this quick and easy way to cook a juicy turkey. And this started a whole new trend. To fry or not to fry: that is the question! There are many pros and cons to frying a turkey. A fried turkey cooks rather quickly at about 45 minutes for your average 12 to 14 pound turkey, compared to the three to four hours that it takes to roast a turkey. A fried turkey will have a crisp brown skin and its meat is tender and juicy. 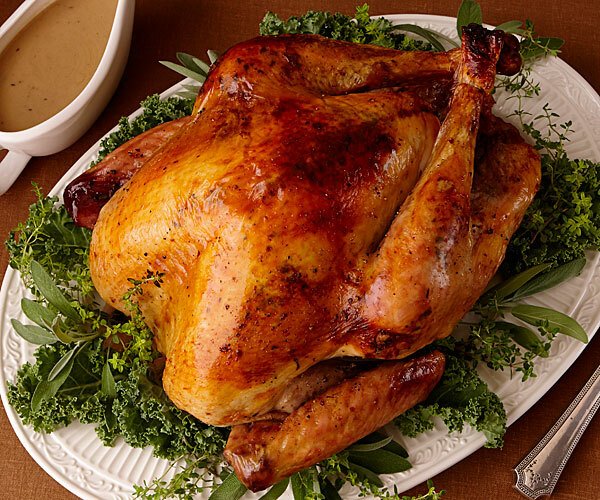 A roast turkey requires basting often and close monitoring so it does not over cook and become dry. On the down side a fried turkey leaves no drippings to use for gravy; it cannot be stuffed, and it must be cooked outdoors. It can be dangerous to cook and much care must be taken to avoid burns and fires. So how do you safely fry a turkey? Make sure the fryer is not over filled with oil; the best way to do this is to place the turkey in the empty fryer and cover with water to one inch above the turkey. Remove the turkey. See how much water it needed. That will tell you how much oil you need to use. You should fry a turkey outdoors at least 10 feet away from your house or other structures. The fryer should be placed on a stable surface made of stone, cement or other none flammable material, and it should not be placed under any overhang or roofed structure. Once you start heating the oil, the fryer should not be left unattended. If the oil catches on fire do NOT use water to try and put it out; this will only spread the fire. According to the fire department, if a grease fire occurs, use a Type B.C. dry chemical fire extinguisher to extinguish the flames and turn off the gas at the supply cylinder. If you do not have a dry chemical fire extinguisher, salt and/or baking soda can be used. The oil should be heated to 350 degrees Fahrenheit and maintained at that temperature. (not any hotter) Make sure the turkey is fully thawed, giblets, popup timer and any other packaging material are removed and the turkey is patted dry inside and out before placing it into the hot oil. When the turkey is cooked and ready to be removed from the fryer make sure that the flame is turned off first, and always wear protective mitts when putting the turkey in or taking it out of the fryer. To enhance the flavor of a fried turkey, the night before I cook it I like to inject a marinade into the turkey breast. I then pat the turkey dry and add a mixture of seasonings to both the inside and outside of the turkey. I remove the turkey from the refrigerator about an hour before frying to allow it to come to room temperature. 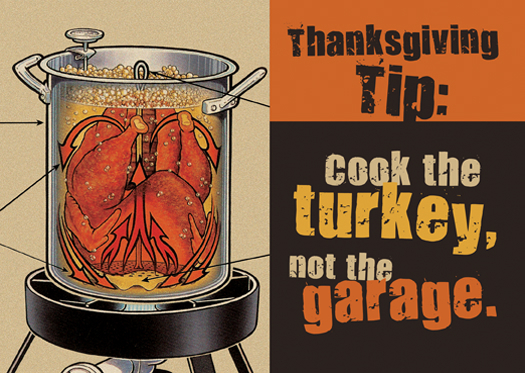 Directions: Combine well and inject deep into the breast of the turkey the night before cooking. Directions: Combine all ingredients. Rub 1/3 into the cavity of the turkey, and rub the rest over the entire outside of the turkey, making sure to get some underneath the skin of the breast.